Ask fellow campers about "Enders State Recreation Area" and nearby attractions. 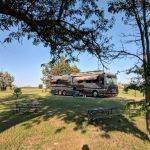 Prior reviews indicate that it is possible to boondock here for $8/night, but if there were places for a big rigs to park for that price, we sure didn't see them. All the camping spots we found, other than ones accessible only by foot, had electric and cost $20/night. We saw no park employees at all, no one checked payment or tags. We took the end space, #23, which was easy enough to pull into and paralleled the water for nice views. There was only one other camper in our section the first day, but all the spaces there were full when we left. All were quiet. The weather did not play nice with us while we were there, so we were glad to have electric hookup. It was too chilly and windy for me to get on the lake with my kayak, but that would certainly have been something to do here. There were a lot of birds including Belted Kingfisher, Great Blue Herons, and American White Pelicans. There is plenty of walking in the park and along the shoreline, restrooms in a couple locations, and a playground in the upper campground. There is a dump station and potable water there, as well. This area parallels the highway, so it is not a peaceful place (unless the weather keeps you indoors where you can't hear it!) We would stay here again if we ever had to pass through the area, though, hopefully with better weather to get out on the water. We camped at Enders State Recreation Area in a Motorhome. 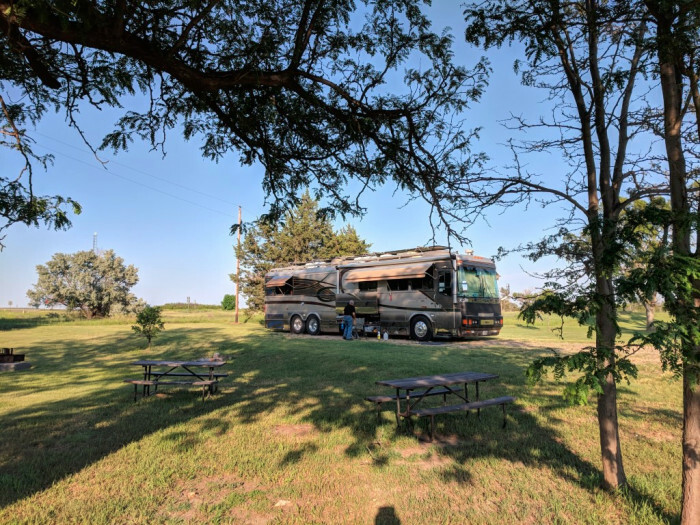 We arrived at Enders Reservoir State Recreation Area on a Saturday in June, and there were LOTS of folks there taking advantage of the pretty reservoir and inexpensive boondocking. The campground has about 30 electric-only sites (all back-in as far as I could tell). Electric-only fee is $20 plus park entry fee of $8/day. Boondocking pays only $8/day. The area on the south side of the reservoir appeared to be more primitive and probably better for tents and/or small rigs, but north side of the reservoir had good roads and easy access - big rig friendly. Dump station, water, electric sites are on the north side of the reservoir. We camped at Enders State Recreation Area in a Motorhome. The park was beautiful. There are great views of the lake. There is only electric or primitive camping. There is one source of fresh water in the park. It is located by the dump station. Our site was fairly level, but we stayed in a more defined spot at the top of the park. We had a great view with shade trees, but we were not right on the lake. The lower spots were not as level, but they were beautiful. The park host was very friendly. We camped at Enders State Recreation Area in a Travel Trailer. Just a one night stay to get some rest. Nice lake. Sites have just electricity, couldn't find the water. New gravel in the sites so it was a little messy. Found just one level pull-through big enough to fit us. Besides the $20 camping fee there is a $5 use fee for the park. The restroom look impressive on the outside but they were not clean and not well maintained. Verizon was good. This is a BOR park but managed by the state. We camped at Enders State Recreation Area in a Motorhome. We stayed in "Area A", as this is where the only showerhouse and dump station was located. The area had very few trees, and was hot and windswept. There were 30Amp hookups, but the "sites" were ill defined. Each electrical post had receptacles for 4 campers to hookup, and you just park however you can to hookup. Very strange.. The coin-op showers were clean and appreciated. We were here the Wednesday night prior to Labor Day weekend, and rigs were arriving steadily. There are dirt roads leading off to remote areas, and people with large rigs were heading down them. Area A was high above the lake, and we walked down to check out the boat ramp and the view. There were several dirt roads leading to remote campfire rings on the shoreline. We passed "Area B" when leaving the next morning, and it looked a little more inviting. The electric sites in "Area A" did not have a lake view. We camped at Enders State Recreation Area in a Motorhome. Are you affiliated with Enders State Recreation Area ?